Volunteers Heather Hill and Mary Duncan with the model of the old brick factory in Cullen. The forgotten industrial heritage of a picturesque Moray town has been recreated in a new exhibition. 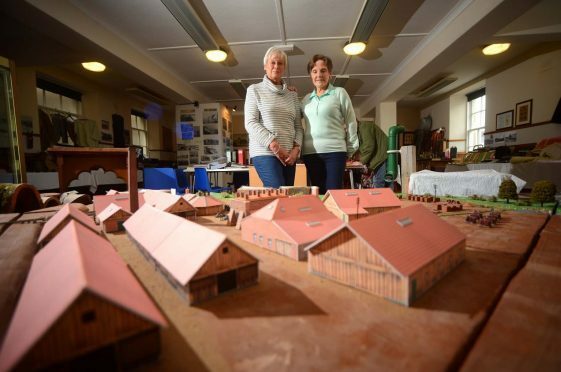 Models of ruined factories and old tools have been put on display in Cullen to shine a light on the residents’ livelihoods at the beginning of the 20th century. The Cullen, Deskford and Portknockie Heritage Group event also features albums, festooned with illuminating photographs, highlighting how the area and locals looked up to 100 years ago. Included in the exhibition is an American-made model of the Tochineal tile and brick works, which shut nearly a century ago. The decaying ruins of the 19th-century factory still stand next to the Burn of Cullen, but people can now see what the buildings looked like in their heyday. At its peak, the works were supplied with clay by a small railway from a pit, which was about 100 yards west of the site. A traditional working shed has also been built in the corner of the exhibition – showing how familiar equipment used in homes has evolved over the decades. Tools, integral to the fishing and farming industries, and which are woven into the landscape of the area, have been donated from those who used them in their daily jobs. Heather Hill, a member of the organising committee, explained the look into the past was designed to reveal a side of the town with which people were unfamiliar. She said: “People don’t always necessarily know what’s around them. There are also things that people know are there, but they don’t know the story behind them. “The tile works just outside Cullen has been closed for a long time. It shut in the 1920s, but I think it reopened again for a short time during the war. The exhibition is running in Cullen’s Memorial Hall every day until Sunday, July 30 from 10am to 4pm. Free entry.